Conan the (rebooted) barbarian – Winning. Words. “We’re not interested in doing an Arnold look-alike contest!” chuckles director Marcus Nispel. As enticing a prospect as that might be… Sadly, the Governator won’t be greasing up and slithering back into his loincloth for this revival of Conan the barbarian. Instead, Nispel’s mission to reboot beloved but tired movie properties (so far he’s hacked out slasher remakes Friday The 13th and The Texas Chain Saw Massacre) sees him drafting in the leaner frame of virtual unknown Jason Momoa for the new sword-swishing brute. Alright, he’s leaner, but is he meaner? A goliath at 6 ft 5, the ex-Stargate: Atlantis cast member certainly seems built for the barbarian role. But the Hawaii native admits he spent many of his school bound years being stuffed into lockers. We can’t imagine Arnie’s C-man putting up with that. Does a new millennium mean a new Conan? 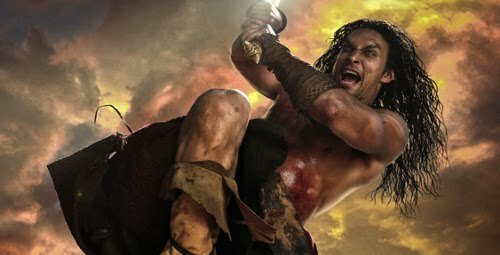 “I did more research with the books [than the movies], to tell you the truth,” reveals Momoa, hinting that this barbaric brawl could be a little dirtier in tone than the Austrian Oak’s hammier interpretation – and more in keeping with author Robert E. Howard’s original creation. Scared, Jason? “If that happened to my family, I’d do the same,” he growls. There might be some Conan in him yet. Previous Danny Trejo – "I kissed Jessica Alba eight times"